Rollex Oyster Perpetual Air King 114234. Rolex Oyster Perpetual Air King 114234. Steel case, diameter 34mm. Water resistant to 100 meters. Automatic chronometer movement. Silver dial with applied Arabic numeral hour markers at, 3, 6 and 9 Luminous index markers. 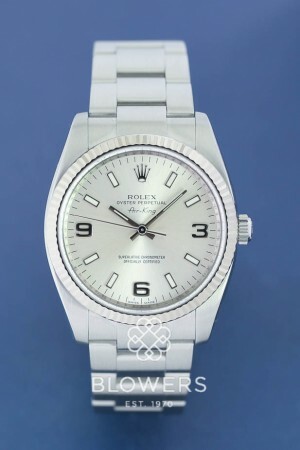 White metal (Rolesor) fluted bezel. Brushed steel Oyster bracelet. Box and papers dated January 2007. Rolex service papers dated February 2018. SKU: 3010420. Categories: Air-King, Gents, Rolex.